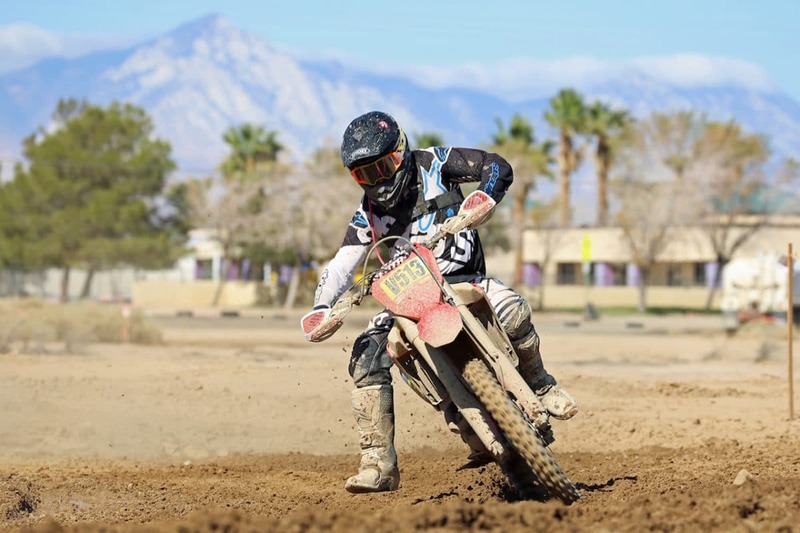 The AMA Big 6 West Coast Grand Prix came to Ridgecrest, California for round six of the series, where cool temperatures and even a light rain treated racers to ideal conditions on the fast, desert course. In the end, Stewart took an important step in the championship by winning the hour-and-a-half feature race ahead of Blayne Thompson and Dalton Shirey. In the Pro II division, Clayton Hengeveld nabbed the win from Mitch Anderson, who led most of the race up until the last mile. 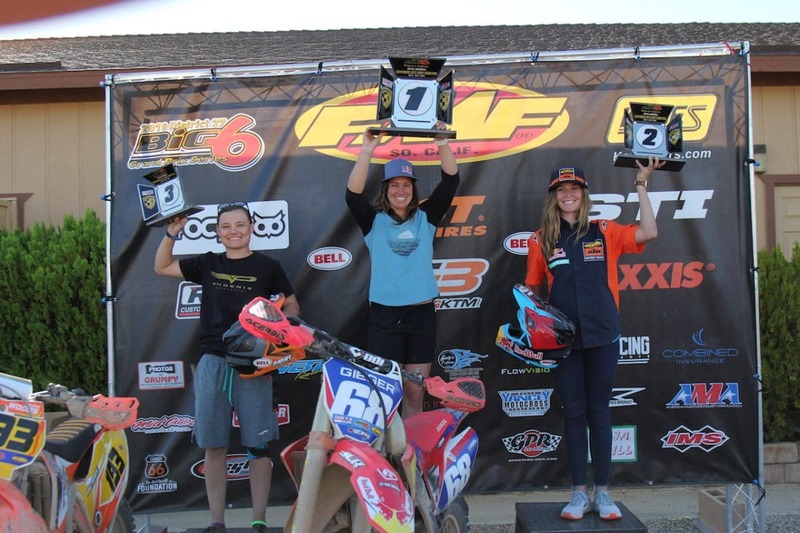 Tarah Gieger made a guest appearance at the Big 6 and won the Women Pro class over KTM’s Kacy Martinez. 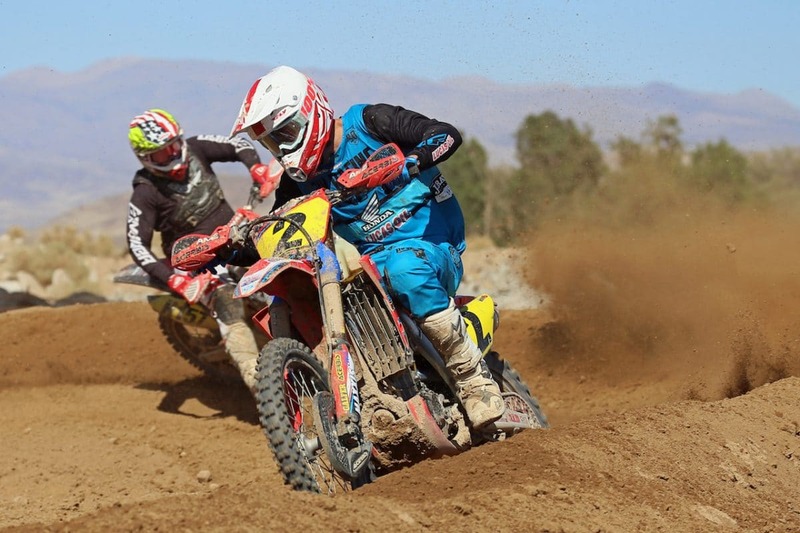 It was a packed weekend for many racers, who opted to pull double duty racing the Mesquite WORCS on Saturday and the WCGP on Sunday. But JCR Honda’s Trevor Stewart opting to focus on maintaining his lead in the Big 6 championship, which proved to be a good move. Stewart led the charge from flag to flag in the WCGP feature race, leading 3Bros./STI Husqvarna’s Zach Bell over the line. Bell, who had taken on Mesquite the day before, admitted he had no more energy to give and simply couldn’t run Stewart down. Adding to Bell’s disappointment on the day was a two-minute penalty he received after the race due to not stopping in pit row before reentering the course. 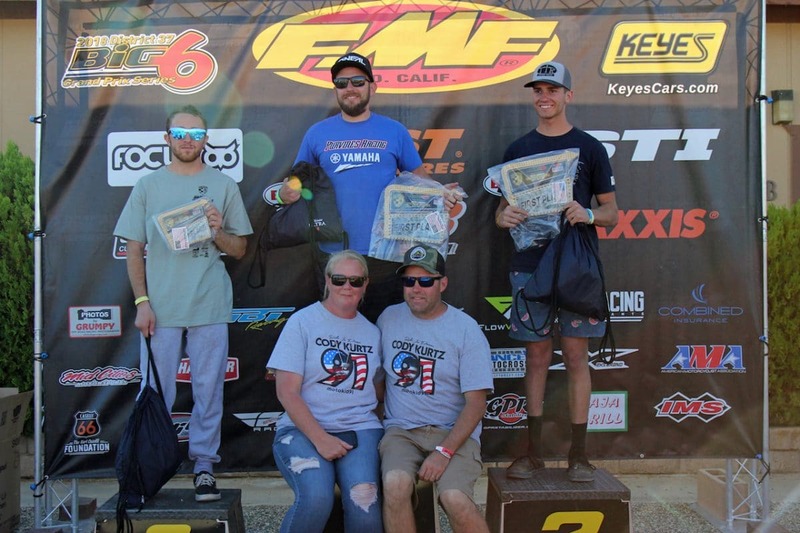 The penalty dropped him from second to fourth overall, yielding the podium to Blayne Thompson and Dalton Shirey. With his closest championship competitor relegated to fourth, Stewart has pulled clear in the points, leading Bell 145 to 116. With two rounds remaining, it is now Stewart’s to lose. At one point, Chaparral Motorsports/Precision Concepts Kawasaki’s Blayne Thompson was trying to reel in Stewart, but couldn’t quite close the gap. 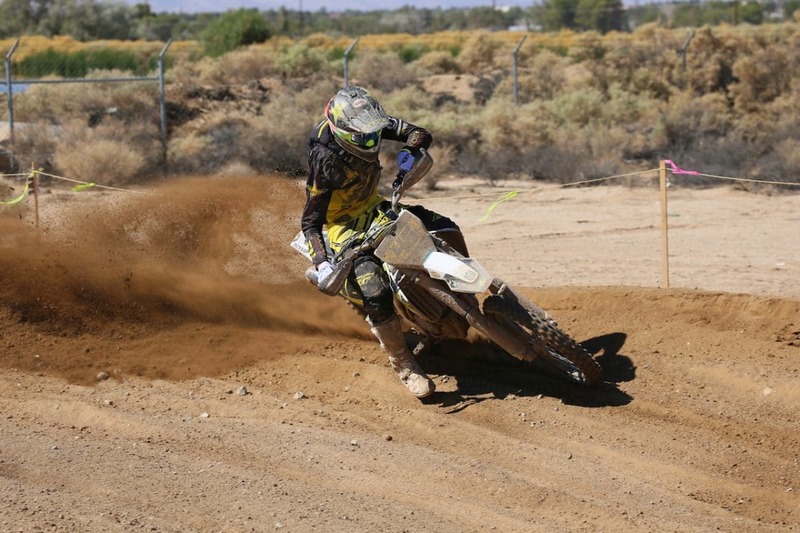 In the Pro II ranks, both Clay Hengeveld and Mitch Anderson pulled double duty, having raced the Mesquite WORCS the day before. While Anderson bested Hengeveld on Mesquite, the tables were turned in Ridgecrest. The duo put on an incredible race, never more than a few seconds apart throughout the eight-lap race and eventually pushing each other all the way into the top-10 overall. 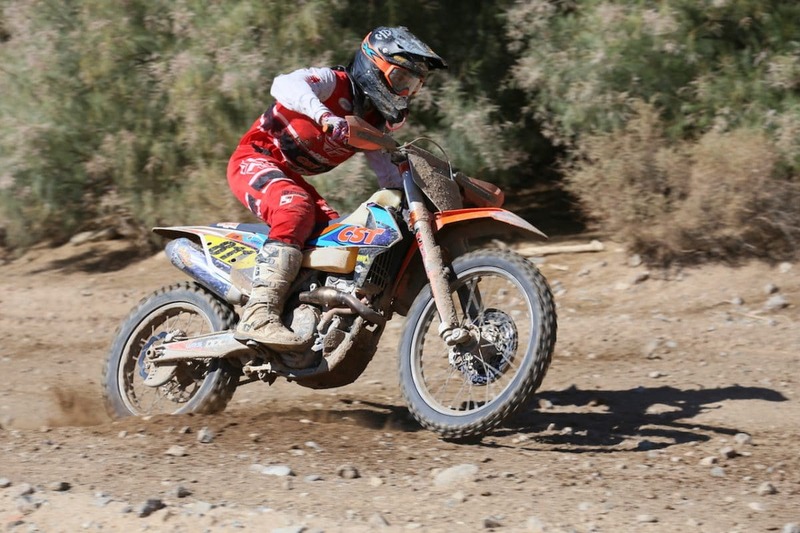 Though Anderson maintained the lead for most of the race, the CST KTM rider had a mechanical flub at the worst possible moment… less than a mile before the finish. 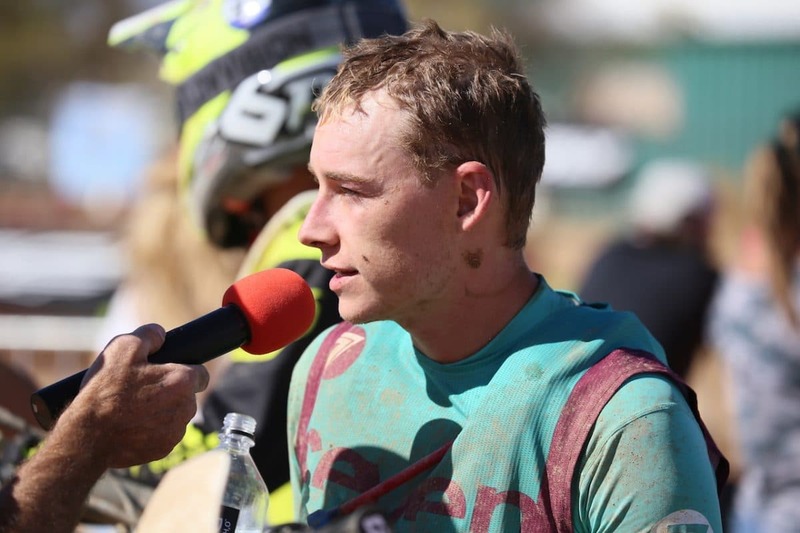 Clutch fade resulted in Anderson blowing a turn on the motocross track, allowing Hengeveld, right on his heels, to sail by for the win. 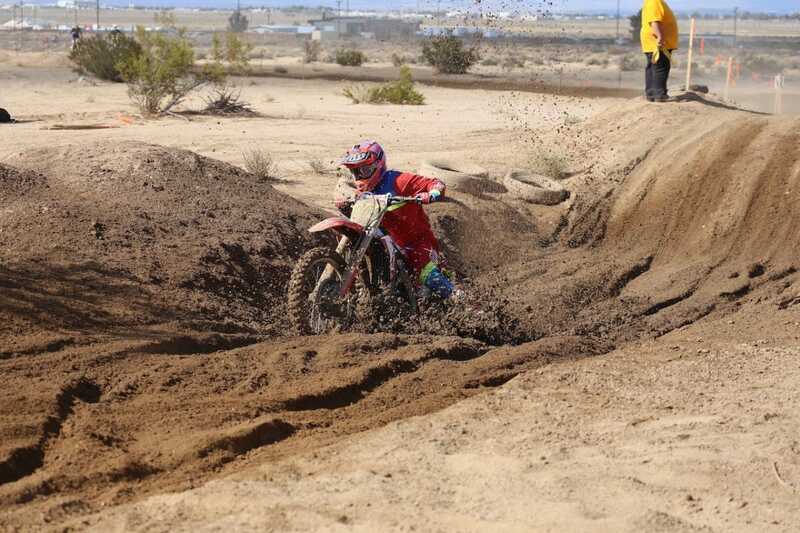 Trevor Stewart put his JCR Honda to good work on the fast course, leading the way for a wire-to-wire victory. It was a tough day for Zach Bell, who was relegated to fourth place after receiving a penalty. 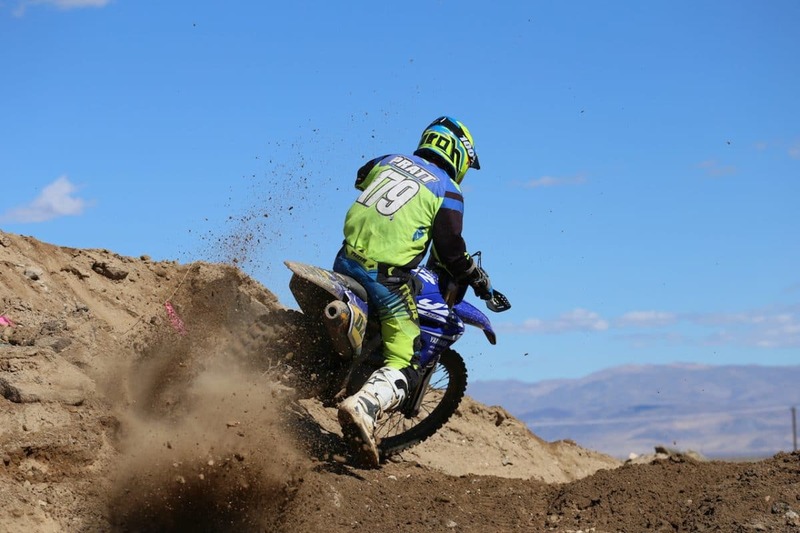 Precision Concepts Kawasaki rider Blayne Thompson ended the day second overall, and also won Saturday’s Heavyweight/Lightweight race. With a little help from Johnny Campbell, Kendall Norman lined up for the Ridgecrest Big 6. 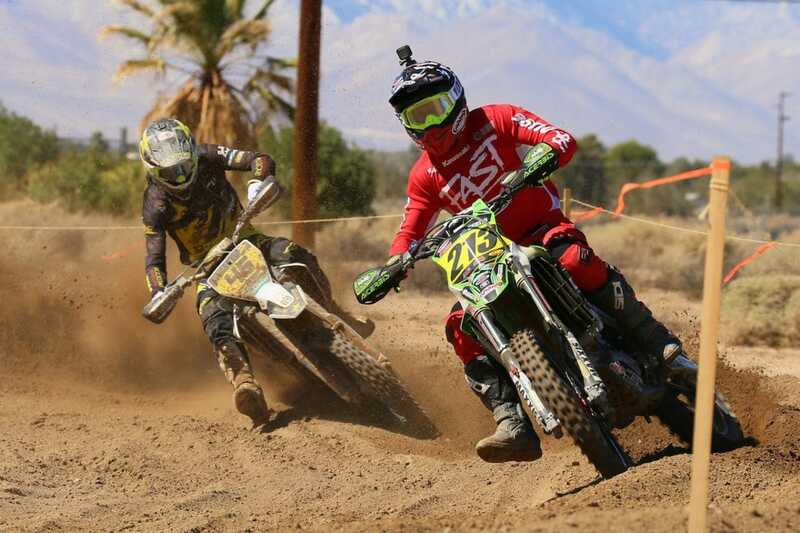 Kendall handily won Saturday’s Vet race and finished seventh in the WCGP Pro race. 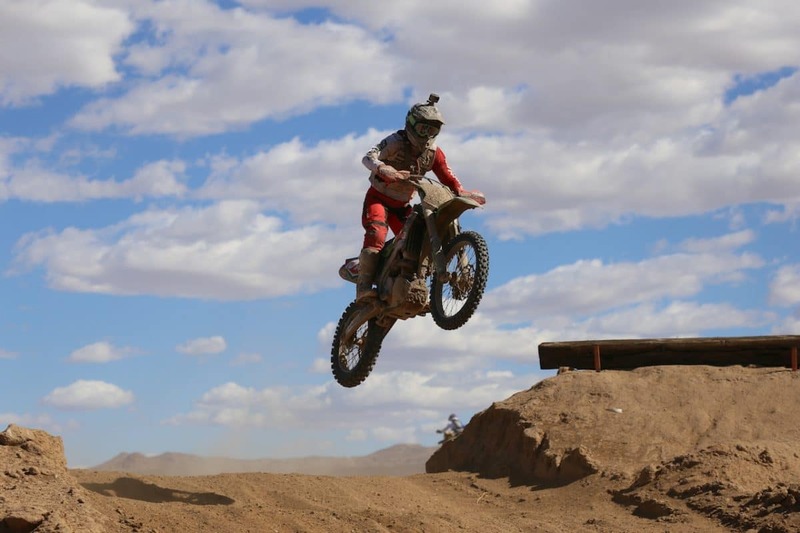 After a race-long battle with Mitch Anderson, Clayton Hengeveld (pictured) made the pass for the lead in the Pro II class on the last lap to take the win. Losing the lead less than a mile from the finish was a tough pill to swallow for Mitch Anderson, but he still called it a fun race. Justin Seeds leads Dalton Shirey on the opening lap. 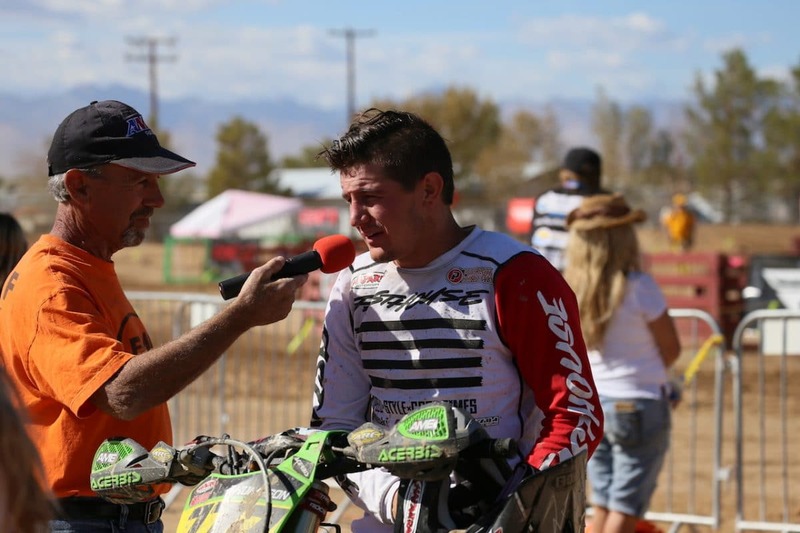 Rockstar Energy Husqvarna’s Dalton Shirey collected third on the day. 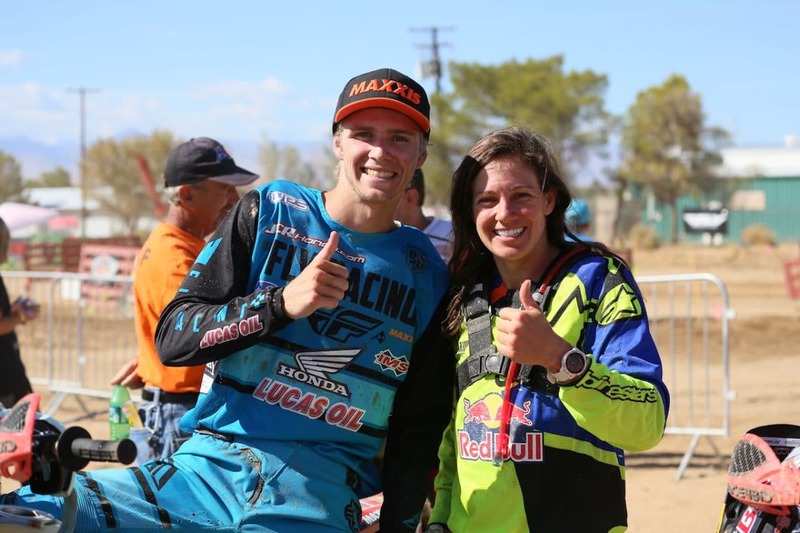 It was a good day for JCR Honda, with Trevor Stewart and Tarah Gieger both taking Pro wins in their respective classes. 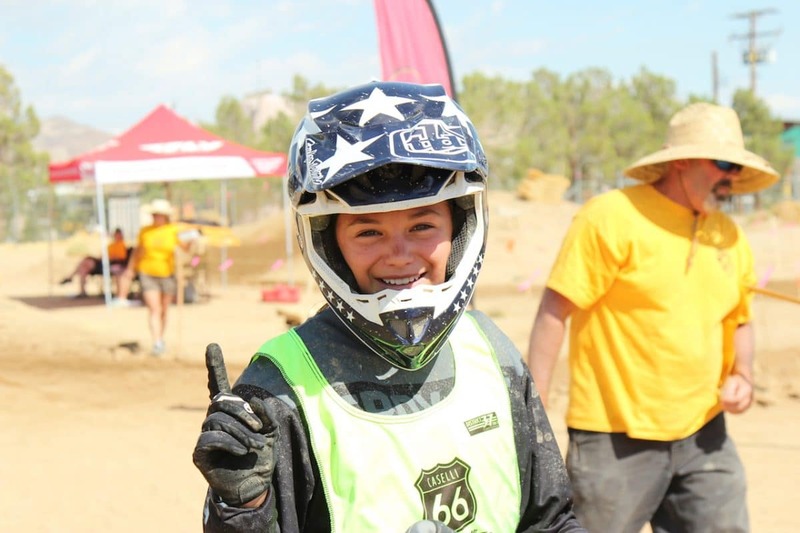 At only 13 years old, Mikayla Nielsen of Riverside, California is blazing fast. 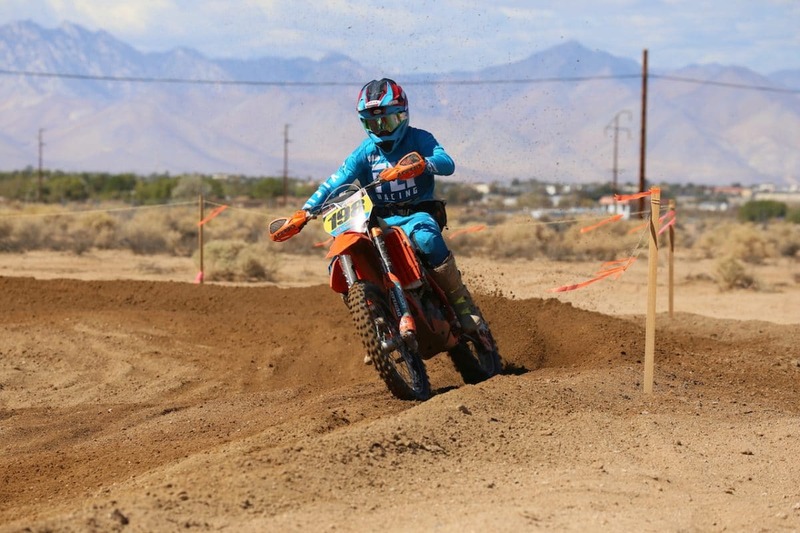 She overalled the Saturday morning Women AA/Masters/Vintage class on her KTM 85. Remember her name! Richard Pratt won the Sunday morning Senior race. Kendall Norman on his way to victory in the Vet race. 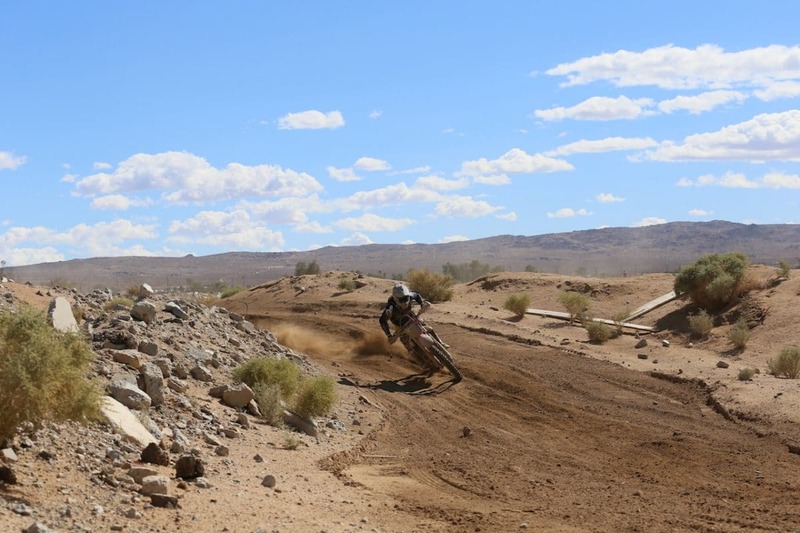 Sunday morning’s Unclassified race/Ridgecrest Challenge was also a Cody Kurtz memorial race. 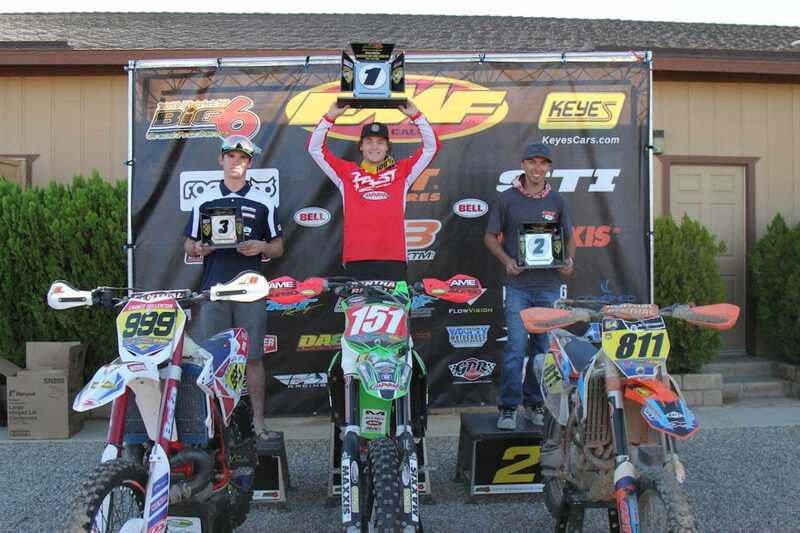 Nick Burson, who would have been Kurtz’ Purvines Yamaha teammate, took the win. 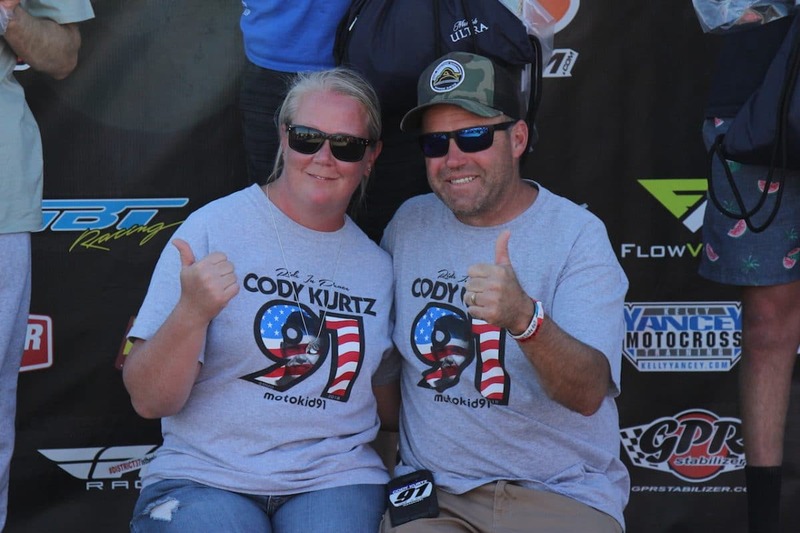 Cody Kurtz’ parents were overwhelmed by the love and support for their late son. Trevor Stewart and Blayne Thompson celebrate on the WCGP podium. Dalton Shirey had left for the day before anyone told him he was bumped up to the podium, so just use your imagination and envision him on the third step. 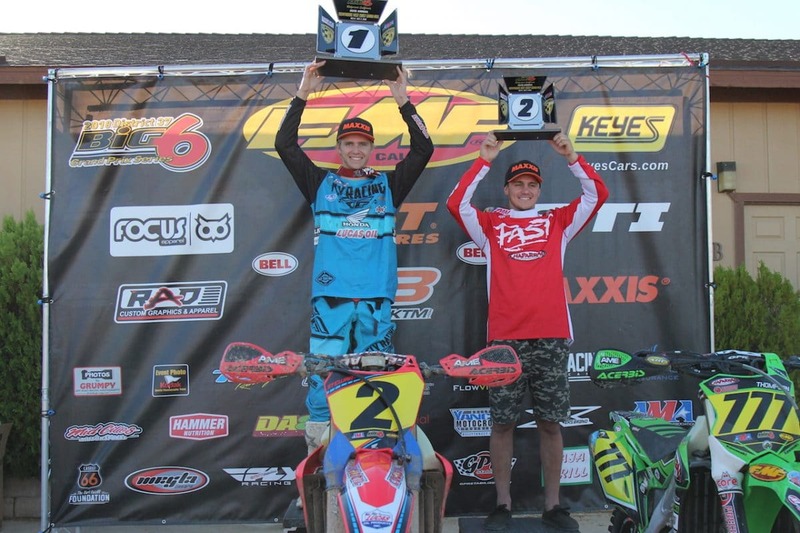 (L-R) Chance Fullerton, Clay Hengeveld and Mitch Anderson on the Pro II podium. Tarah Gieger enjoyed her first-ever Big 6 WCGP win ahead of Kacy Martinez and Lauren Woods. 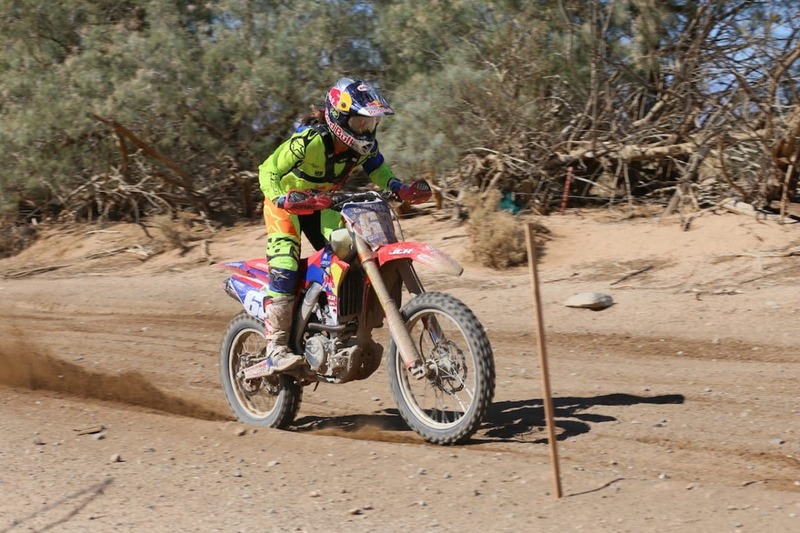 JCR Honda rider Tarah Gieger was racing the Ridgecrest Big 6 as part of her preparation for the upcoming ISDE in Chile, and won the Women Pro class. It looked as though Brandy Richards was going to run away with another Women Pro victory, but a mechanical failure (suspected water intake) ended her day early.